Home » Recorder Pro, is it all downhill from here? Recorder Pro, is it all downhill from here? Recorder Pro iPhone App Review. We've had this iPhone app in the queue for quite some time now, when Recorder Pro was available for free after changing its name from iDicto. We must apologize to the development team over at DAVA for not posting the review earlier, perhaps before the new OS 3.0 was launched, which includes the Voice Memo native app. Reviewing Voice Memo from Apple is not what we're going to be doing, but needless to say that all the nice functionality we get from Recorder Pro (previously iDicto) is available with Voice Memo. On to Recorder Pro, the app does exactly what it was intended to do, record voice memos, events, stories, what have you, of any length, depending on your free storage capacity. 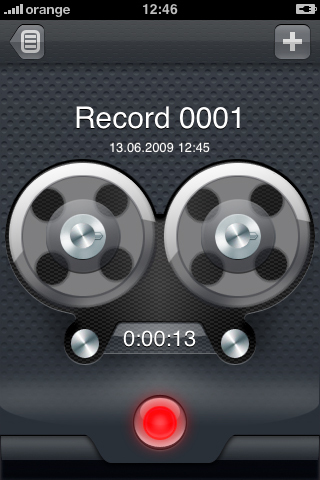 Starting and stopping a recording is simple, and is done simply by tapping the record or pause button. Each recording is assigned a date, time and length, and, additionally, you can choose to asig it a name, associate it with an icon to group several recordings together under the same icon, and even a priority level. Feel free to pause and restart recording whenever, or pause and rewind during playback. Perhaps one important feature we saw missing from the Voice Memo app was the Sync function that allows you to copy the voice recordings from your iPhone to your MAC or PC via WiFi as easy as taping a button. You're not restricted to file size either, which is another big plus for Recorder Pro. But the big question remains. Is it all down hill from here for Recorder Pro and similar apps now that Voice Memo is provided free of charge right from the box? We don't believe that, because we put our trust in developers and encourage them to create apps that are more interactive, more creative and with more functionality than ever before. For now though, Recorder Pro must evolve into something else, something that users would not only download but also prefer to use instead of the out-of-the-box app. Either that or fade away. What do you think of Recorder Pro ? Scroll down for our comment section and let us know! O Youtube, Youtube! Wherefore Art Thou Youtube? Recorder Pro can't sync to your desktop, the WiFi transfer still doesn't work, even when connected to a WiFi network it says "Not connected to Wi-Fi network". For me, not being able to download these files to my desktop make this app practically useless. Cant get the recorder pro to sync with my desktop?? I just bought the 4.1 version and the WiFi does not work! I contacted support and they said, when that happens you need to reboot the iPhone. Several reboots later - still nothing, no WiFi sync, it says i am not connected to WiFi (i send a screen shot to support showing my WiFi full bars and the error message, still waiting for a response). Recommendation: if you record large files that you cannot email to yourself and need to WiFi sync them, do -not- buy this app. Where are these RecorderPro files saved when I do back-up in my laptop? I want to find them, copy and paste them in another laptop. Is this possible at all? If you do not recommend using this app (for not being able to sync, which I agree) then what is another alternative that would let me synchronize the recorded files? Thanks.